Order Booja Chocolate Ice Cream from the Online Health Food Store UK. Buy Booja Booja Dairy Free Hunky Punky Chocolate - 500ml and other quality Frozen Foods safely online in the UK. Made with nuts, not dairy. Luxurious rich, truffley smooth, dark chocolate. Dairy free, gluten free, vegan and vegetarian ice cream. Where to buy Booja Chocolate Ice Cream safely online? Shop at the Online Health Food Store if you are wondering where you can buy Booja Booja Dairy Free Hunky Punky Chocolate - 500ml safely online in the United Kingdom. 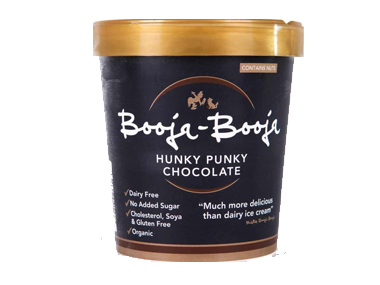 Booja Chocolate Ice Cream - Booja Booja Dairy Free Hunky Punky Chocolate - 500ml in Frozen Foods and Foods.